Thinking ahead to summer. Thought I would share this post again, one of the highlights of our 2014 European trip. 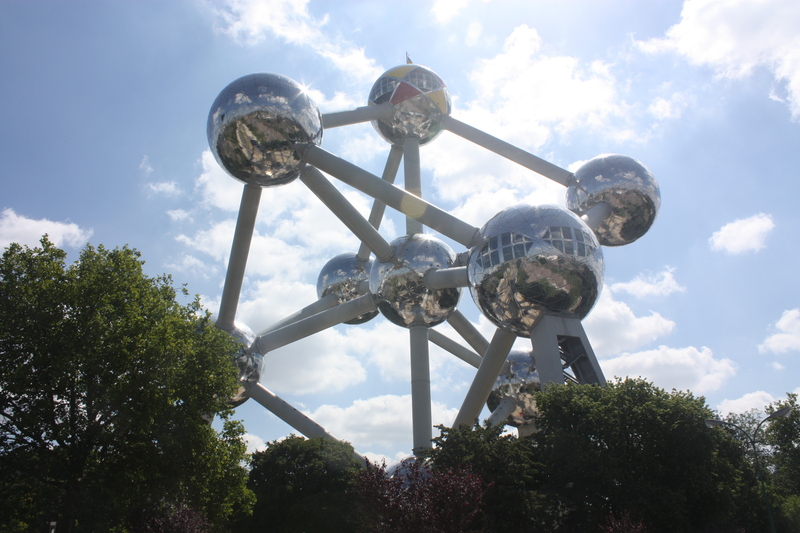 I had seen it in the distance when I visited Brussels briefly in 2009. The building fascinated me, but with only a few hours to sightsee I concentrated on the downtown core, not having the time to figure out public transit. This time it was a priority. Built as the centrepiece of the 1958 World’s Fair, the building and the interior display brought back pleasant memories for me, not of Brussels but of Montreal and another World’s Fair in the summer of 1967. We lived in suburban Montreal, which meant the islands that had been built in the St. Lawrence River to host Expo ’67 were miles away (we didn’t use kilometres then), but there were direct buses several times daily from the local shopping centre. My parents thought nothing of putting my younger brother (age 9) and me (age 11) on the bus early in the morning and picking us up at 11 p.m. We would roam those magical islands separately and together. No responsible parent today would ever grant such freedom. The season passport cost, if I remember correctly, $15 for children, and was worth thousands for the educational experience. Looking out from the observation deck in the Atomium (which is 102 metres high) you can see some of the national pavilions that were created for Expo ’58. They have found other uses, while many have been torn down. The same has happened in Montreal. The buildings may be gone, but the memories live on. There was Scouts Day with Lady Baden Powell, widow of the founder of the Boy Scout movement. I didn’t see Haile Selassie when he visited, but I remember being annoyed the Ethiopian pavilion was closed that day. The Soviets were friendly – somewhere I probably still have a set of slides of Russia I won in a drawing contest they ran. Given that I have absolutely no artistic talent and never have had, I suspect the idea was to give young Canadians a favourable impression of the Soviet Union. Didn’t work – the slides didn’t fit in the family slide projector. There were corporate pavilions as well as national ones. The Bell Telephone pavilion offered working videophones (technology that has only now begun to catch on with Skype and FaceTime). As an adult I have some regrets about Expo experience. I was just too young to get the most out of it. As an impatient kid I missed out on a couple of really popular pavilions. Czechoslovakia I am told had a really great glass-blowing exhibit, but I wasn’t willing to spend any time in a lineup, which for that pavilion could be as long as three hours. I also breezed through the entire African continent, in about an hour. Each country’s display looked the same to me; I paused only long enough to get my passport stamped. I thought the concept of a World’s Fair had pretty much had its day, but apparently I was wrong. I discovered that Expo 2010 in Shanghai set attendance records, though I never heard about it. And there are four future World’s Fairs scheduled. Certainly the cost of staging such an exhibition has ballooned, and there are security issues that just didn’t exist in 1967 or 1958. Building a signature building, such as the Atomium (or the Eiffel Tower to use a 19th century example) would seem to me to be cost prohibitive in these days of limited budgets, but I guess not for everyone. I would also suspect that the information contained in a pavilion’s displays is now all readily available on the internet. With the world already on your desktop, how do you make the educational experience of a World’s Fair meaningful?